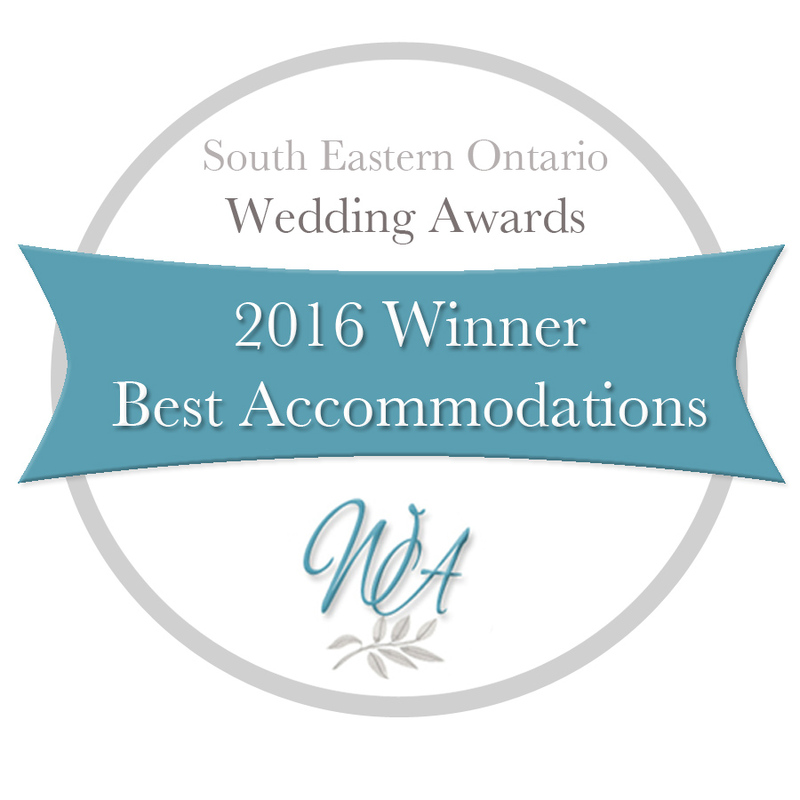 2016 South Eastern Ontario Wedding Awards Winner for Best Accommodation! Thanks to Jen Fitzpatrick of Serendipity Studios & The Wedding Shoppe for the great honour! Download our convenient Wedding Booklet which features all of the info below. (Available in PDF format). Many feel the ambiance of the historic Cove Inn is perfect for that special wedding celebration. The Inn was built in the late 1800’s and still captures a lot of it’s original charm yet provides all kinds of modern comfort. We would be happy to provide you with any or all of the wedding services you require including your choice of reception, guest accommodations, meal style, ceremony location, rehearsal party, etc. We have two ideal outdoor locations for your ceremony in our gardens overlooking the water of the Westport Pond or Upper Rideau Lake. Perfect settings for your special day! Our dining/lounge area can accommodate approximately 100 guests and your menu can be as varied as you like to meet your specific needs! To ensure you get your menu exactly right, why not come in for a tasting with Chef Sarah Brown! For all other detailed discussions and planning, we invite you to contact our wedding host Maureen Price personally and/or please read the info below. It is always best to call between 10-11am or 3-4pm daily. 1.888.COVE.INN or info@coveinn.com. We can offer many different options for a wonderfully delicious menu. Here are some EXAMPLES for your inspiration! COLD – Antipasto Platter, Artisanal Cheese Platter, Domestic Cheese Platter, Fresh Vegetable Platter, Smoked Salmon on Pumpernickle, Caprese Skewers, Fresh Fruit Platter with Dipping Sauces, Gazpacho Shrimp Shooters and more. HOT – Lamb Meatballs with Sweet Mint Chutney, Chicken Meatballs with Tzatziki, Jerk Chicken Skewers with Mango Lime Dipping Sauce, Thai Chicken Skewers with Peanut Sauce, Mini Quiches, Bacon Hoisin Rumaki, Crab Cakes with Remoulade, Spinach and Feta in Phyllo, Polenta Bruschetta, Tuscan Bruschetta, Cajun Grilled Shrimp Skewers, Butter Chicken Flatbread, Bacon Jam Scallops, Carmelized Onion + Blue Cheese Bacon Bites and more. SOUPS – Potato Leek with Bacon (or not), Tomato Parmesan, Tomato Basil, Carrot Ginger, Creamy Swiss Onion, Classic Turkey Rice, Beef Barley, Sweet Potato with Peanut and more. MAINS (For Served or Buffet Dinners) – Prime Rib with Pan Gravy, Beef Filet, Roast Beef, Beef Wellington with Red Wine Sauce, Maple Glazed Salmon, Festive Roast Turkey, Maple Dijon Glazed Smoked Ham, Herb + Apple Stuffed Pork Loin, Prosciutto Wrapped Chicken Stuffed with Goat Cheese, Arugula + Red Pepper, Orange + Honey Glazed Roasted Chicken, Pasta Carbonara and more. VEGETARIAN: Polenta + Goat Cheese Stacks, Grilled Vegetable + Goat Cheese Tart, Butternut Squash Ravioli, Roasted Vegetable + Ricotta Lasagna and more All Mains served with potato and vegetable options. LATE NIGHT BUFFET – Poutine, Midnight Mac ‘n Cheese, Sliders, Taco Bar, Fajita Bar, Classic Sandwiches/Wraps/Pickles/Cheese and more. Items from our Lunch and Dinner Menu also available. Buffets are great for those looking for something expedient and less expensive and are a desirable option for large groups. Served items can be great for smaller groups and allow for a more relaxed multi-course meal. Buffets and Served dinners can include soup or salad, dessert and tea or coffee and all non alcoholic beverages. Our kitchen can supply a variety of specialty dishes including those vegetarian, vegan and gluten free. We’re very flexible and creative with menus! Always open to new ideas. Cocktail Hors D’Oeuvres can range from $10-20 per person depending on the ingredients and quantities needed. By the way, post ceremony outdoor cocktail bars are really cool! Consider using a canoe for your outdoor ice cooler! Why not consider a Late Night Buffet…Or a Rehearsal Party on the Patio overlooking the sanctuary the night before your big day If you have a theme you want to suggest to be festive. Many great things to consider. We work with an Incredible Trio (Piano, Bass and Drums) who perform at The Cove regularly. The Spencer Evans Trio are highly entertaining and are capable of playing many styles for many tastes. Spencer himself can be reached at spencer_evans@yahoo.com or 613.547.9645 home or 343.363.9645 cell. We also suggest the great Shawn McCullough who is a master guitarist/singer. He specializes in country and rock performing in different configurations from solo to 5-piece band. He can be reached at nshawnmc@gmail.com or 613.453.9587. Also at our disposal are great DJs, other Singer/Songwriter Performers, Minstrel/Traditional Music, Solo Pianists, Karaoke and Jazz, Celtic, Rock, Funk, Country, Folk, Blues, Dance and Soul Groups and much more! In the past our lounge has comfortably accommodated approximately 100 guests and up to 180 guests using both rooms. 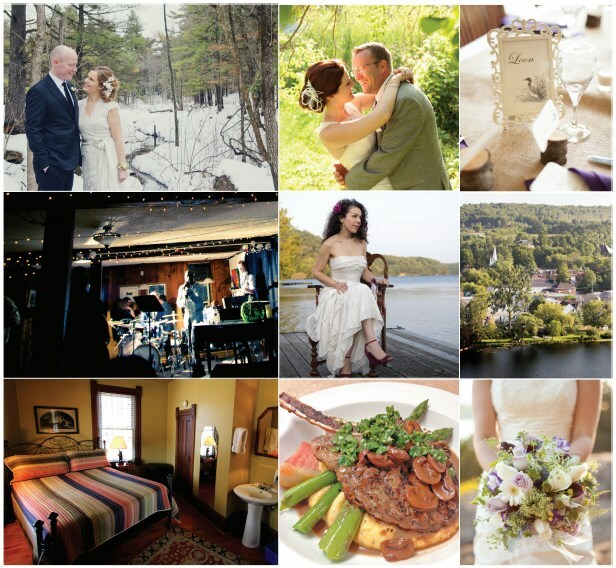 We are situated right on the water with the Fredenburgh House overlooking the Upper Rideau Lake and the Main Inn overlooking Westport Pond so our site is an ideal location for beautiful photos and a picturesque wedding ceremony. Our patio offers a cozy setting over a beautiful lower lawn overlooking the Westport Pond and Foley Mountain. In the event of inclement weather, we can hold the ceremony in the Lobby of the Main Inn. Our lounge, dining room and lobby are all well appointed with lots of natural light and our staff is warm and helpful. We find that most interested couples prefer to visit us for a meeting and tour of our facility well in advance of their day. At this point, a consultation with our wedding planner will take place where all information will be taken and a deposit for payment will be made. Rates are based on double occupancy per night including full buffet breakfast and require a 2 night minimum from June to September. Please take a look under the Contacts link, scroll down and find alternate accommodation for your guests in Westport and area! Includes all we presently have here at The Cove: tables, chairs, glassware/foodware, dance floor, candles, etc. We invite you to be as creative and decorative as you like with our room! It’s your day! There is a Flat Fee of $1000 for use of the facility which includes wedding planning services, event set up and clean up, extra housecleaning and extra service. Wine Corkage fees are $20 per bottle or choose from our great, extensive wine list. Any extra or different tables, chairs, linens, etc. can be rented from several rental companies at cost or the client may bring their own. Tents may be rented for outdoor waterside receptions. We have a wheel chair entrance ramp and we have ample parking. For your guests’ liesure, we provide canoes, paddle boats and kayaks for guest use. At the Fredenburgh property, there is a pool, wonderful lake swimming off of our waterfront docks, free docking, sun lounges in the yard and BBQ. There is free WIFI and there are many shops and boutiques in Westport and many walking trails and sites to see in the surrounding area. We have the full service Sundari Day Spa located beside The Cove. Please contact Sarah Fenner 613.273.8799 or sundaridayspa@outlook.com – www.sundaridayspa.com for all inquiries. Country Shears Salon is located just off of The Cove Lobby. Call Donna Breen at 613.273.3146. Feel free to ask us about photographers who have worked with wedding couples here in the past. There are so many to choose from! Past Wedding Photography @ The Cove! We plan to make your time here at The Cove, the best we possibly can. We welcome your inquiry and look forward to serving you!